This cartoon will change the way you think about Luke Skywalker. | the rut. This cartoon will change the way you think about Luke Skywalker. Damn that’s wrong, Phil. Just plain wrong. LOL You are very funny, I am glad to have found your blog. 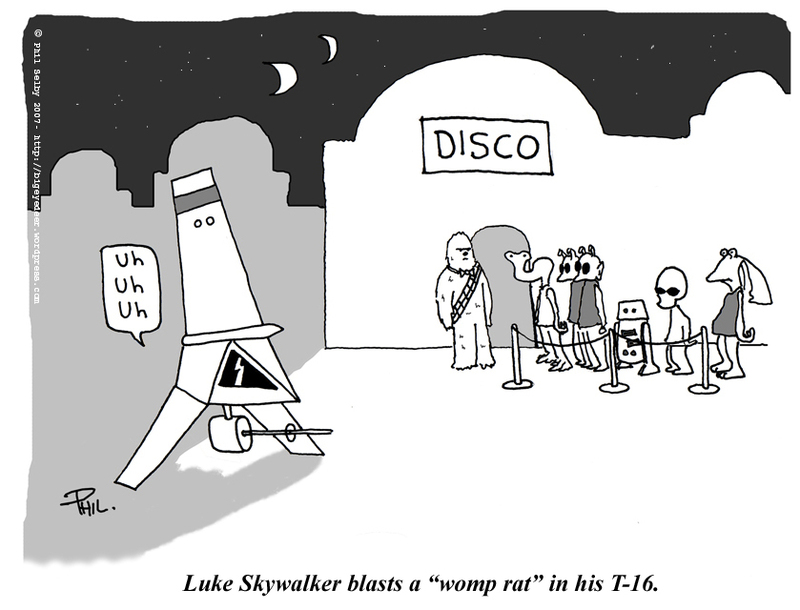 haha, ok, so just for the record, this wasn’t meant to mean that Luke was making sweet love to an actual womp rat. I just imagined Luke picking up whatever girl he could at the disco, and the next day his friends saying” Hey Luke who was that womp rat I saw you leaving with last night, eh?”. Though really, it wouldn’t surprise me if he WAS in there with an actual womp rat… after all, he did fancy his sister for a while. Thing is, I never thought of Luke being an engineering student and completely deprived. I guess he’s only human. I knew it… that Jedi oath of “celibacy” is a show-off. I got it and thought it funny as usual. Keep them coming!! Sorry dude. He’s banging the womp rat. « This cartoon is a real son-of-a-birch.